Yes, I am a glutton for punishment. I am planning on going to OD yet again. On poor Steel. She’s gonna run away from home! This will be the first time I have asked her to carry my heavy self over ANY mountain, not to mention the Old Dominion mountain. And last year she didn’t complete because she blew a shoe and made her foot sore. Fingers crossed. Miss Daizy is down for a couple months while we try and determine if her left leg injury from January 2015 is causing her to go crooked and is twisting her back on the longer rides. All last year, she competed and went down hill on her scores until the final ride at AERC Nationals, where she injured her foot. This is the injury. It took from Jan to Apr 2015 to heal over. Then it was still raw looking well into July. She did compete on it and seemed to do okay until Nationals in October. In retrospect, I wonder if I should have just given her the entire 2015 season off while it healed. I gave her five months off after Nationals and then started her back to work this spring with Rabbit Run. She was very tired and completed with a sore back. Then at No Frills, we had to represent at the end because her back was so sore she was trotted lopsided. I massaged her for half an hour and went back and she barely squeaked by with a completion. And last, at NEATO (which was a to-die-for-ride) she started getting sore at the start of the third loop and by the time we finished, she was trotting crooked and gimpy. I massaged her and she did improve with some minor head bobbles, but she did not complete. Had the Chiro out and her back was pretty much as it always is. He adjusted her. Then had the vet out who took ultrasounds of her rear leg, watched her move, manipulated her back and did flexion tests on all four legs. The injured leg has scar tissue sitting on the check ligament and had a lot of excess fluid build up. The flexion tests proved that hock did not want to bend as much as the right hock, but she did trot off on it sound. The vet suspects that the scar tissue is irritating her check ligament and she compensates by moving crooked, which in turn makes her back sore with a rider. He suggested giving her six to eight weeks off and redo the ultrasound to see what changes she has. Current diagnosis? Miss Daizy’s endurance career may be over. She seems to do fine for 30 to 35 miles then she starts to get sore. She may be able to do CTR’s and that’s it. Or, with a lighter rider, she may do fine. We will let her have the time off and see what happens. Now, while I write this story, we are in a five day 90 degree weather pattern. The OD ride is two weeks away and I’m wondering if we won’t have an opportunity to have a heart attack because we’re gonna melt first. Thursday – June 9th – I looked at the weather forecast for Saturday’s ride and the Northeast is about to get hit with a very high temperature influx. Only a 20% chance of a passing storm so I can’t even count on that to cool me off. I do *NOT* do well in the heat so I am contemplating skipping this ride. Why subject myself to the possibility of getting another heat stroke (at OD, no less). I will make my final decision tomorrow morning after looking at the weather one more time. I know that Dawn and Cindy will be disappointed if I don’t ride. My motto is “Ride My Own Ride” and I’m pretty sure I can’t do well in 94 degree temps with no crew and one hold is away and I’ll be without all my “hold stuff” which would include things I’d need to get myself cooled down. The weather channel is posting heat warnings for Orkney Springs, VA and the heat index is supposed to be near 100 for the day. It is with sadness and tears that I have decided not to attend this ride. last year I had a heat stroke and it was only 86 degrees. I do not want to die (just yet) and I can’t subject my 17 year old Steel to riding in those conditions on the toughest trail on the East Coast. My friends are disappointed that I am not coming, but I have chosen to “Not Ride My Own Ride” which is exactly what a good endurance rider does. And checking the weather for Orkeny Springs, VA one more time before I go to bed. Just to be sure that I made the right decision (because it’s killing me that I’m not there this weekend) And the heat has increased yet again. No way I would have survived 94 degrees with a 60% humidity. I feel the pain of those of my friends riding tomorrow. So, I will ride here at Blue Marsh on Sunday to keep Steel tuned up to go up to Vermont and ride the 75 mile trail. If I can find a crew to go with me. 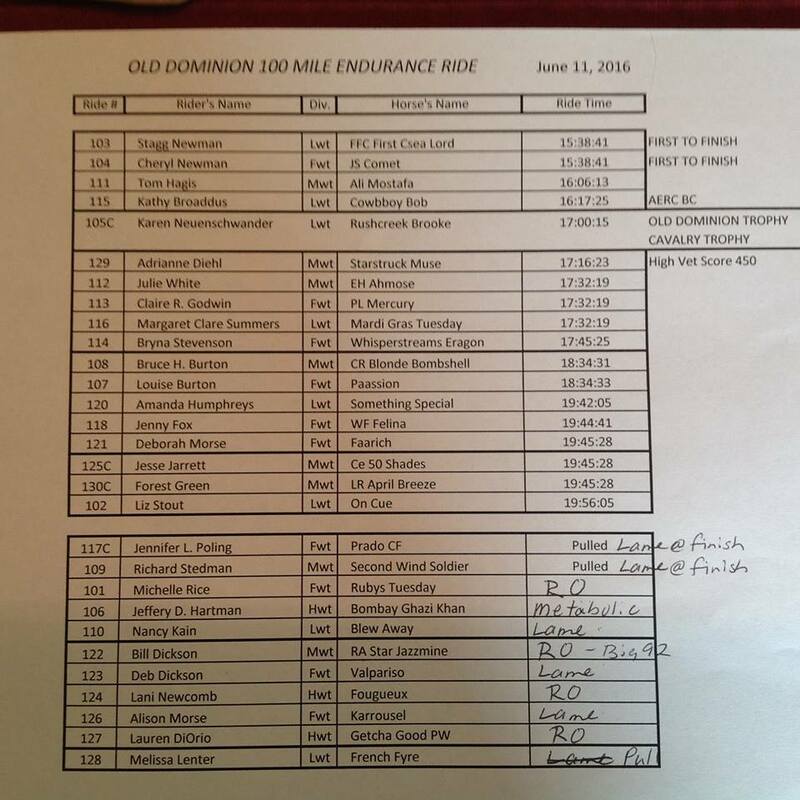 Here’s updates as they come in for the OD Ride. Back into Bird Haven, Six miles to go for the 50 milers. 69* 50 milers started. 39* 50 miler rider completed. 56% completion rate is actually pretty in line for OD 50 milers. Michelle Rice, Nancy Lain, Julie White Ded Dickson, Lani Newcomb, Lauren Diorio, Melissa Lenter.. So, 100 mile riders are finishing a very hot, very tough ride and the temperatures as they are crossing the finish line are still in the upper 70’s. Not only are the horses tough for making it through in these kinds of heat conditions, but the riders and crews for those riders are remarkable. It is still my goal to do 100 miles this year. I’m glad I didn’t do it at OD! 1:41 am Stagg and Cheryl Newman are out of Bird Haven………. 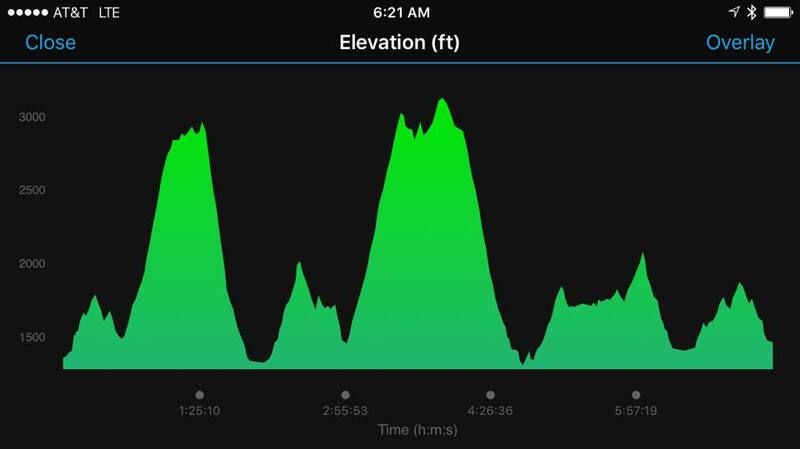 2:10 am Adrianne Drehl and Karen Neuenschwander are in Bird Haven..
For those of you interested, this is the extreme elevation changes on the 50 mile ride. This does not show the rocks, boulders and sheer cliff drop offs. I sure did miss doing this ride this year.